If there is something positive about the technical grandiosity of Hollywood, it is the chance that it affords the daring directors to recreate their childhood fantasies in all their grandeur. True, at first sight these fantasies may appear amusing, and even childish, but they do manage to retain the charm that touched us at that tender age. And what is cinema without a touch of the implausible? But some of these works really do end up appearing fatuous, though not when a Spielberg or Cameron is on the job. They bring all the unalloyed vision of a kid to life. However, this particular endeavor by Cameron leaves one high and dry (frankly, all the water in this movie only made me feel thirsty in this humid climate of our city). With another arduous construction of another disaster, Cameron, surprisingly, fails to appeal to the audience' emotion. Expecting emotions in his movies is definitely not asking for the moon, as even a Terminator could be appealing in such a way. What we get here is a couple on the verge of a break-up, and then in the midst of a disaster that somehow manages to rekindle their love for each other. May sound intense enough, but it ends up about as warm as the bottom of the ocean. But, first, the remainder of the plot. 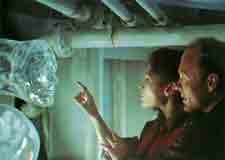 A nuclear submarine, USS Montana, drowns under suspicious circumstances, and the help of the crew of an oilrig, led by Virgil 'Bud' Brigman (Ed Harris), is sought by the navy to salvage the nukes. There is also Bud's soon-to-be-ex-wife, Lindsey (Mary Elizabeth Mastrantonio) who provides the variation in the equations between the characters. Things don't go too smoothly as the navy seal team, led by Lt. Coffey (Michael Beihn), in its eagerness to save the sub from the Russians, cause the cranes on the mother ship to fall. Though the cranes miss the rig, they fall into the abyss, drawing it right to the edge of the cliff.Adding to the mystery is the presence of an unearthly object, seemingly alive. But life has more than its share of earthly problems in store for this crew, as Lt. Coffey becomes paranoid about the crew, and we have a villain. Once he is taken out, the nukes, which are at the bottom of the ocean, need to be disarmed. Bud is the man of the job, and in the only real warm sequence in the whole movie, we witness him plunging into the depths on liquid oxygen, only to exhaust it on reaching there. With no hope of making it back, Bud awaits his death. As you wonder what the mysterious object was doing in the movie, it appears to take him into an alien world, further deep into the ocean. The movie ends with Bud rising to the surface along with that world. A truly awesome scene, but one that beats the imagination. Why would an alien world, so intricately created, reveal itself to this world for no reason? Whatever the movie may have appeared like upon its release a decade ago, right now it doesn't rise above the rut that sci-fi movies have become. Though the decibel levels are thankfully low, the dialogues continue to smack of shallow humor, and some of the happenings are ridiculous enough to be funny. Consider this: Bud is trying to revive Lindsey with the help of electrodes and various techniques, but to no avail. So guess what does the trick? A slap and a few ear-shattering exhortations. All you medicos reading this, explanations from you are eagerly awaited, and Bollywood may please move over. So, all that one can appreciate about this fiasco is the utter professionalism on the part of Cameron and his team when it comes to shooting scenes that most makers would balk at conceiving. P S: Reportedly, quite a sizeable footage of the movie has been chopped from the final product - scenes that showed more interaction between Bud and Lindsey, and Bud and the aliens. Maybe, a viewing of this footage will yield that emotional streak that we sorely missed. Be the first to comment on The Abyss! Just use the simple form below. fullhyd.com has 700,000+ monthly visits. Tell Hyderabad what you feel about The Abyss!